It reminded me of a pincushion I made some time ago. The pattern was in the Australian Inspirations magazine. It was one of those things I made knowing it would never be used for its intended purpose!! It’s just too pretty!! I embroidered the design on silk dupion, the inside support was made from a ring of cardboard. The roof is actually a length of ribbon gathered up. 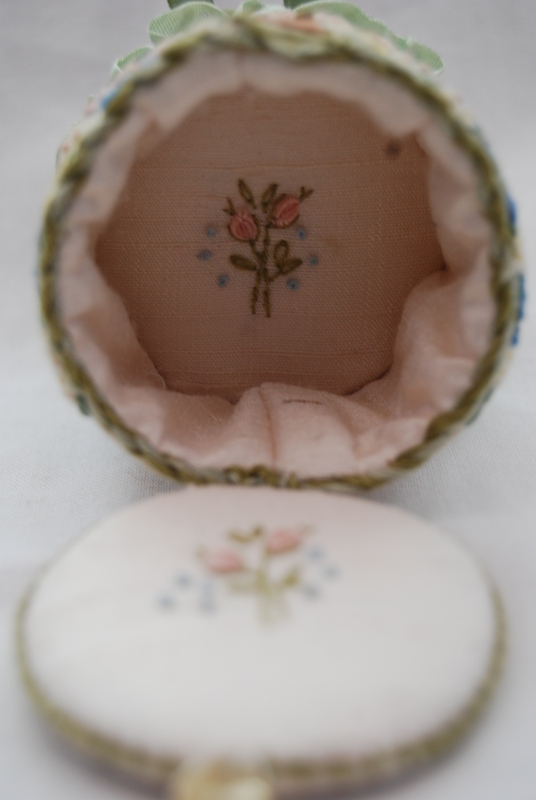 Inside is a thimble holder, all embroidered with roses. 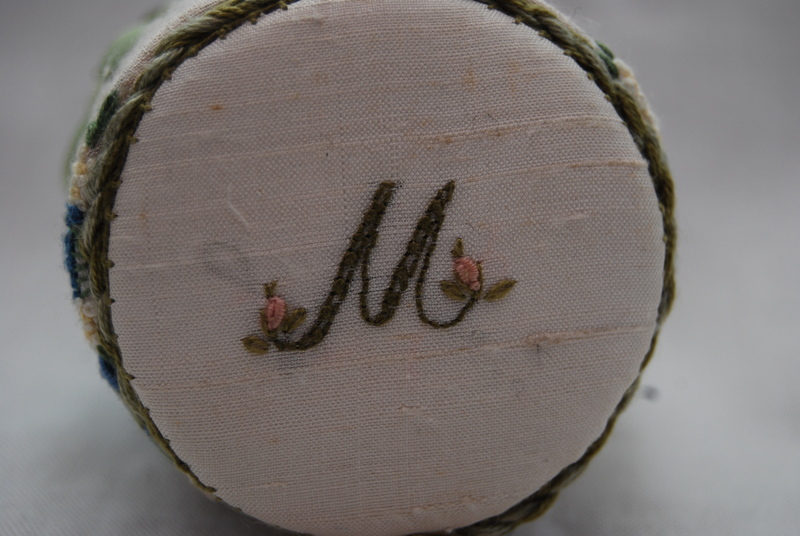 My initial is on the base which is fastened with a little glass bead and a loop of thread strengthened with blanket stitch. I love it, the design is just exquisite! 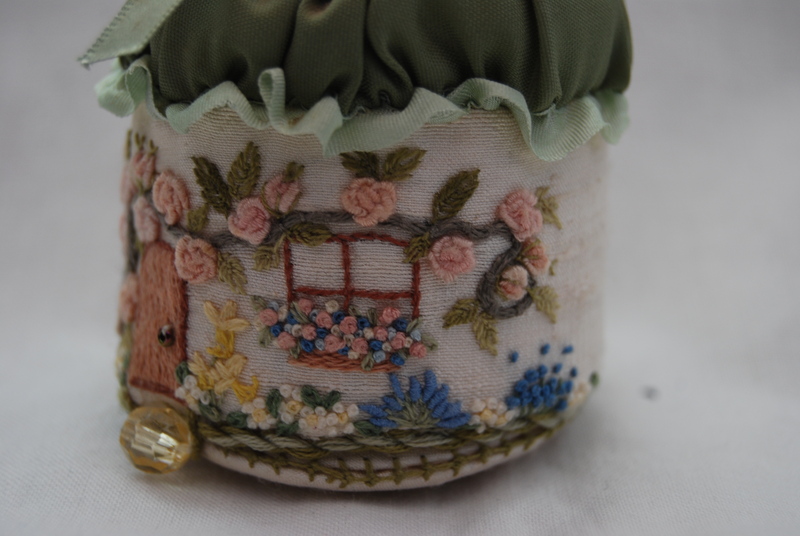 This entry was posted in Crafts and tagged embroidery, pincushion. Bookmark the permalink. So perfect and sweet… love it! Thank you Karen for your kind comment, have a good Christmas! Exquisite it the perfect word to describe this! I agree it is too pretty to use and must just be admired as art! 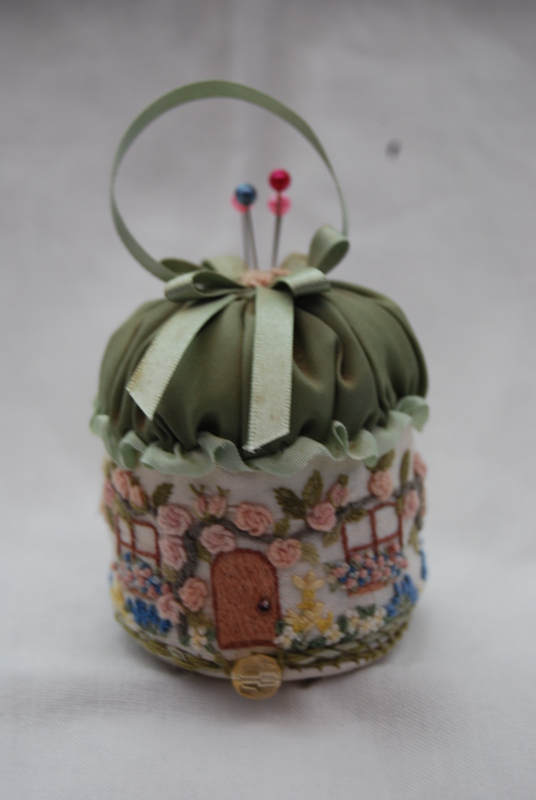 Hi Tanya, thanks for your king comments, my pincushion just sits on a shelf looking pretty! this is sweet and gorgeous ! Thanks for popping by again Gwen, how’s your garden doing? Have a good Christmas! My garden is asleep at the moment looking brown and wet except for the wintergreenplants and shrubs. Have a great Christmas too ! Very pretty! 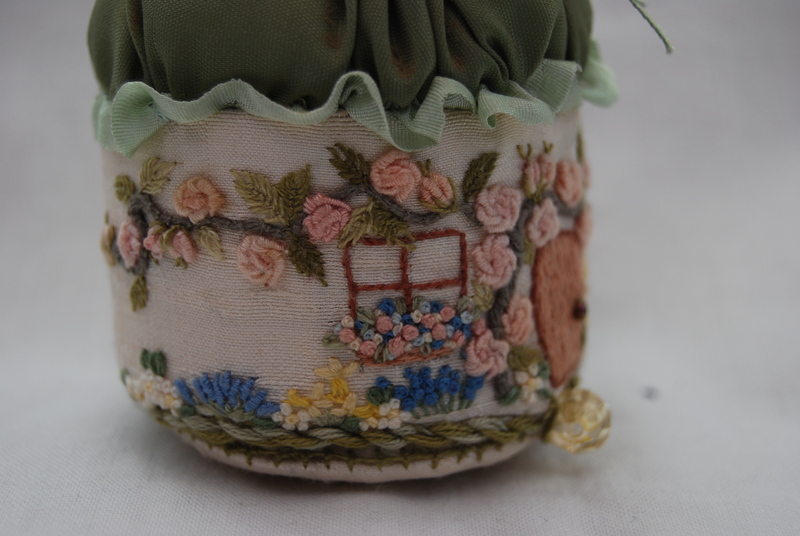 I love the little place to keep your thimbles! Hi Gail, thanks for your kind comments, I quite fancy using the idea of a thimble holder with a pincushion but I need to have a simpler design!! That is so pretty! 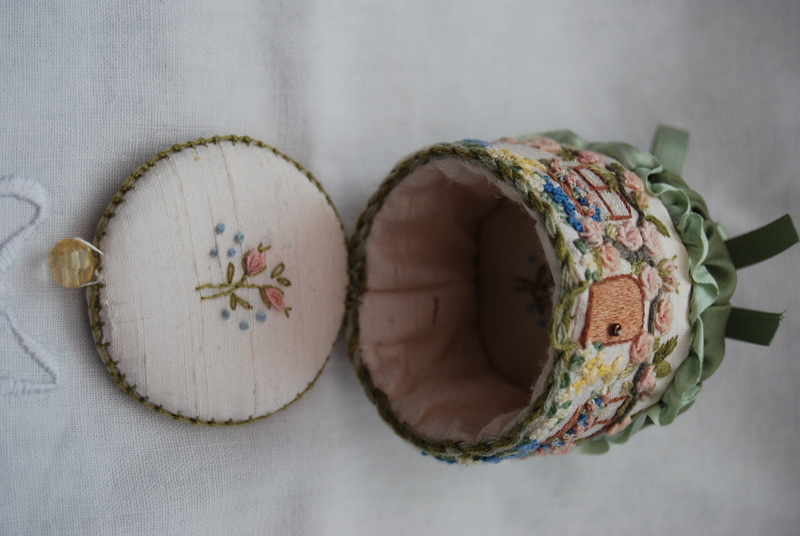 I have a little pin cushion which is too pretty to use (as a pin cushion that is). I need to think about creating a little shelf where I can display my pretty (unusable) things and stop hiding them in a cupboard. Hi Dasha, mine is out on a shelf looking pretty! That is the most prettiest pin cushion I have ever seen!! Ohhh that is absolutely beautiful! I love the pincushion you did for the swap, too. The ladybird is cute. I’ve popped over from Slow Stitching Sunday and so glad I did! Hi Sue, thanks for popping over and for your king comments.